Solid wood frame with birdseye maple and black walnut veneer. Lower part closed with wood panels decorated with geometric inlays. Lighting available on request. Showcase with structure, doors and drawers front in ash veneered wood and solid wood. Drawers runners with Blumotion technology. Back panel covered with synthetic leather. Brass Decò handles, with buffalo's horn inset. Showcase with structure, door and drawers front in ash veneered wood and solid wood. Drawer runners with Blumotion technology. Back panel covered with synthetic leather. Brass Decò handle, with buffalo's horn inset. Display cabinet with two wooden and glass doors. Glass shelves. The interior is lined in beige fabric. Light walnut finish and flower handles. A space to be shared and enjoyed together, an elegant and welcoming space perfect for entertaining your guests. 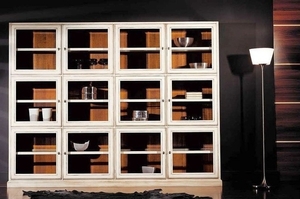 Length: 97.5 cm Height: 164 cm Width: 46.5 cm With 3 shelves. Also available with glass doors. The show-cases are precious with floreal carvings and decorations. A traditional display case is used for storing and displaying products or objects. Its design and construction are familiar or standard. On ArchiExpo, such furniture is arranged by properties including type or finish. These pieces are used in the home for kitchenware or other objects allowing them to be visible, and at the same time protected. A display case has shelves behind glass doors and may also have drawers and cupboards. They can blend in easily with period furniture. They are also used for exhibitions or display purposes in commercial and public environments. Storage uses include the display of tableware in a restaurant. Solid wood, sometimes lacquered, varnished or waxed, is often used to manufacture these display cases. Consider style with respect to other furniture in the room. Dimensions should suit the space available, leaving enough room for cupboards to be fully opened without hindering circulation. Ensure that the size of compartments is appropriate for the items to be displayed. Determine sturdiness and stability, required maintenance and how often special finishes must be reapplied.